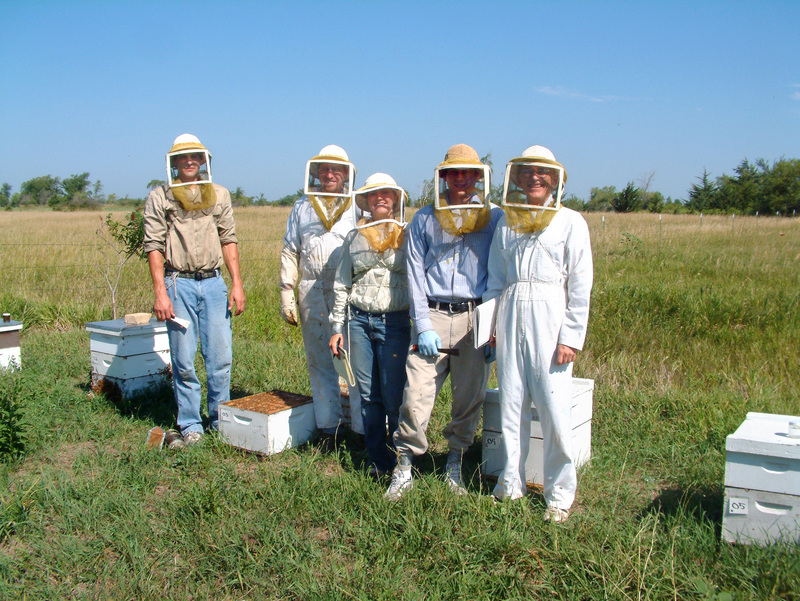 The "Bee Team" from the UNL Department of Entomology takes a break from measuring square inches of brood. From left: Jeremy Wagnitz, Bill McCormick, Sarah Mack, Nick Aliano and Bob Roselle. The University of Nebraska State Museum's next Sunday with a Scientist program for children and families will explore the fascinating world of honey bees. The program will take place from 1:30-4:30 p.m. May 20 at Morrill Hall, south of 14th and Vine Streets on the UNL City Campus. Museum Sunday hours are 1:30-4:30 p.m. The event will be led by Professor Marion Ellis of the University of Nebraska-Lincoln Department of Entomology. Honey bees serve a very important purpose in the environment, pollinating many of the fruit, vegetable and seed crops grown in Nebraska. There are 95 crops grown in the United States that depend on bee visits to set fruit or produce seed, but the wild honey bee population has declined dramatically in recent years due to introduced bee diseases and parasites, threatening many of the plants we enjoy and depend on. Sunday with a Scientist visitors will learn about the factors affecting honey bee health and research conducted at UNL to keep honey bees vigorous and healthy. Keeping honey bees is an increasingly popular hobby and sideline business. Guidance on getting started in beekeeping will be offered, and beekeeping equipment will be available to discuss with experienced beekeepers. Visitors will be invited to participate in a honey tasting quiz to see if they can recognize the floral source of honey samples. The event will also feature an "ask a beekeeper" booth where visitors may ask any questions they have about bees, beekeeping, and pollination. Visitors will also learn about native bees, and how to plant pollinator gardens to encourage and observe them. Collections of native bees will be on display to help visitors learn to identify common Nebraska bees. For more information on bee research and education programs at UNL, visit http://entomology.unl.edu. Sunday with a Scientist is a series of presentations that highlight the work of State Museum scientists and those from other UNL departments and institutions, while educating children and families on a variety of topics related to science and natural history. Presenters will share scientific information in a fun and informal way through demonstrations, activities, or by conducting their science on site. Sunday with a Scientist programs are 1:30 to 4:30 p.m. at Morrill Hall on the third Sunday of each month. The University of Nebraska State Museum in Morrill Hall is open 9:30 a.m. to 4:30 p.m. Monday-Wednesday and Friday-Saturday, 9:30 a.m.-8 p.m. Thursdays, and 1:30-4:30 p.m. Sundays. Regular admission is $5 for adults (19 and over), $3 for children (5-18 years, 4 and under are free), and $10 for families (up to two adults and children). UNL staff, faculty, and students are admitted free with valid NU ID. Friends of the Museum are also free with valid membership card. There is an additional charge for planetarium shows. Parking is free. For further information, telephone the museum at 402-472-3779, visit its website, www.museum.unl.edu, or Mueller Planetarium's website, www.spacelaser.com, or contact Kathy French, Education Coordinator, at 402-472-6647 or by email.